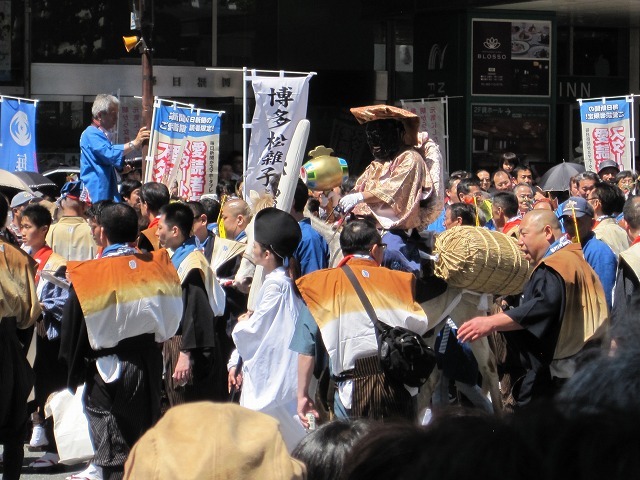 Before the year changes, I’m going to introduce this Hakata Dontaku Festival (博多どんたく祭り) in 2014(almost forgot to write about this). 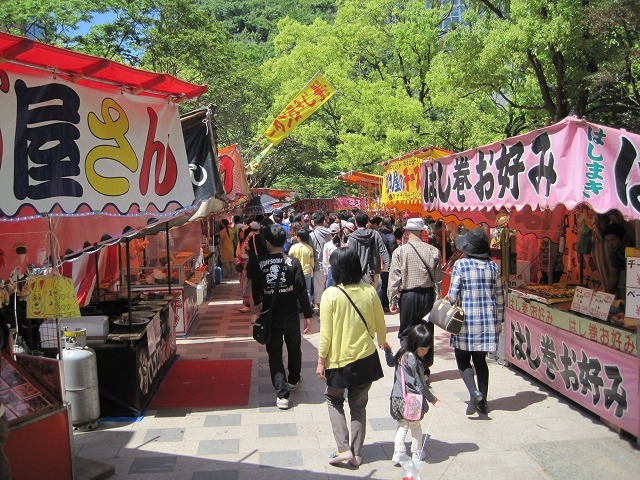 In Fukuoka, there is one of the biggest festivals in Japan. In the beginning of May, over 2 million people visit the festival and there are over 30,000 of participants perform in the festival. 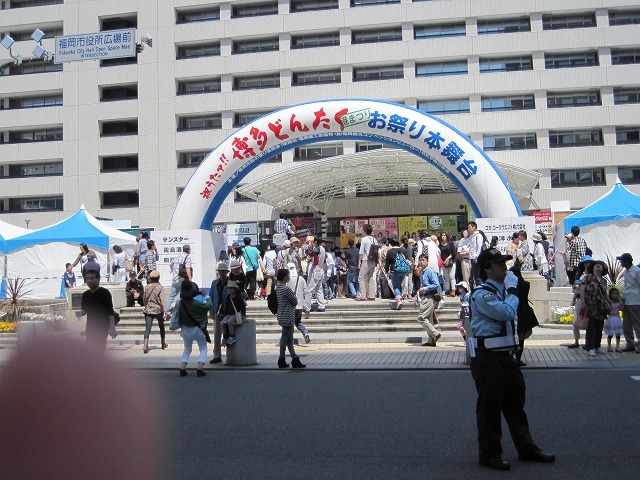 What is Hakata Dontaku Festival? The origin of this Hakata Dontaku is called Matsubayashi that started in 1179. Matsubayashi was a classic event, which was held at the beginning of the year to celebrate the good fortune. In Matsubayashi, people dressed up and visited the houses of authority, performed dancing and singing. 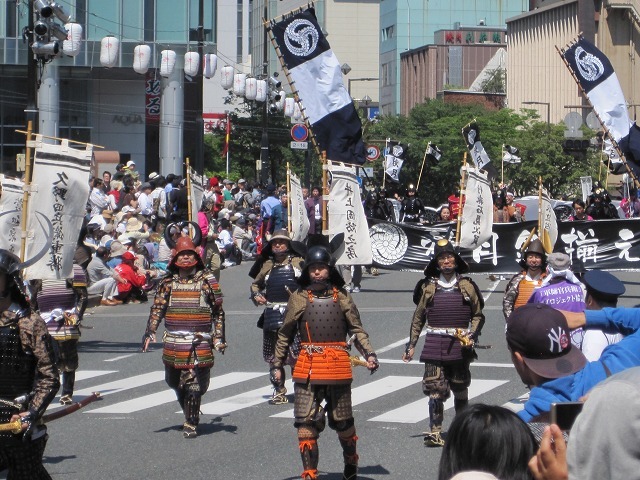 Matsubayashi developed as Hakata Matsubayashi, taking over its form and it’s become part of the parade during the festival. 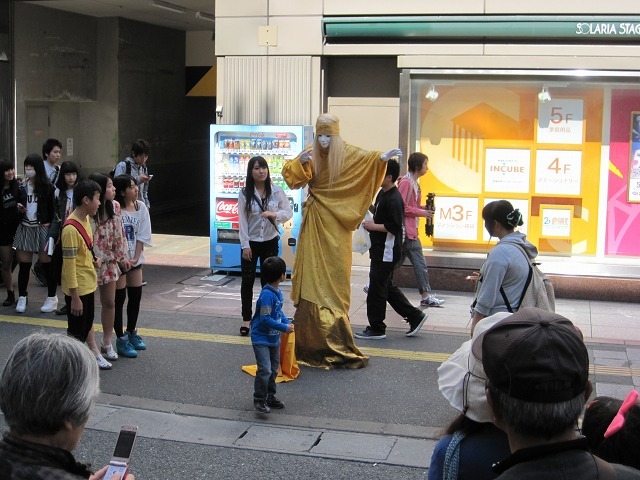 In the parade, Hakata Matsubayashi group walk through the streets and visit the places such as government office buildings, companies, shrines and temples. 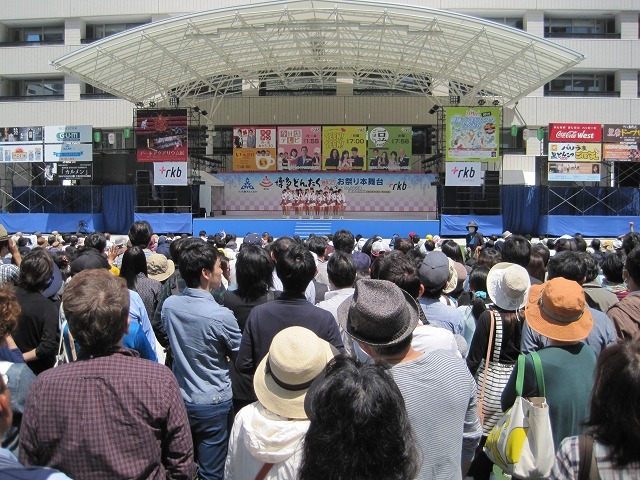 It can be said that Hakata Dontaku festival is composed of two main parts. In the first part, there are stage shows by the participants of the festival at many places in the city. 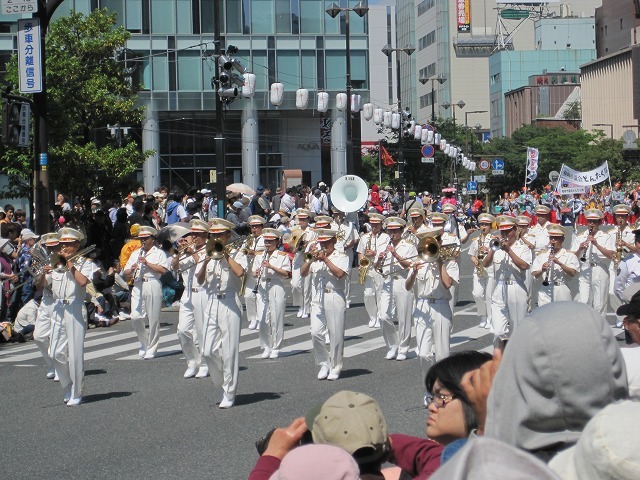 The other main event of festival is the parade on Meiji street. 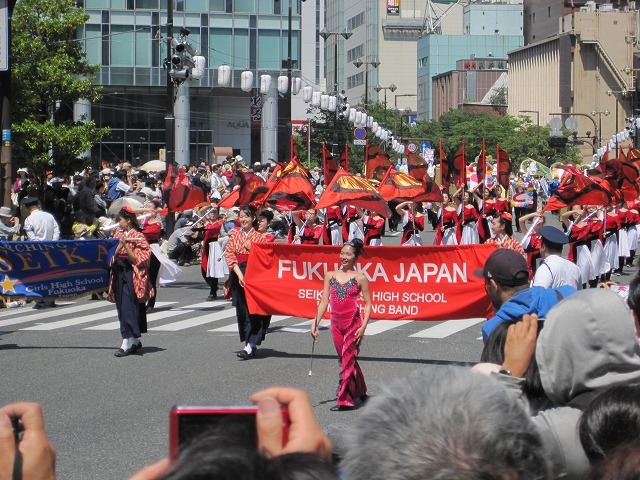 The participants join the parade and walk through the Meiji street on May 3rd and 4th. And we can see Hakata Matsubayashi in this parade. This is the first time for me to see Hakata Dontaku festival even thoughI I live in Fukuoka for a long time　(strange isn’t it?). 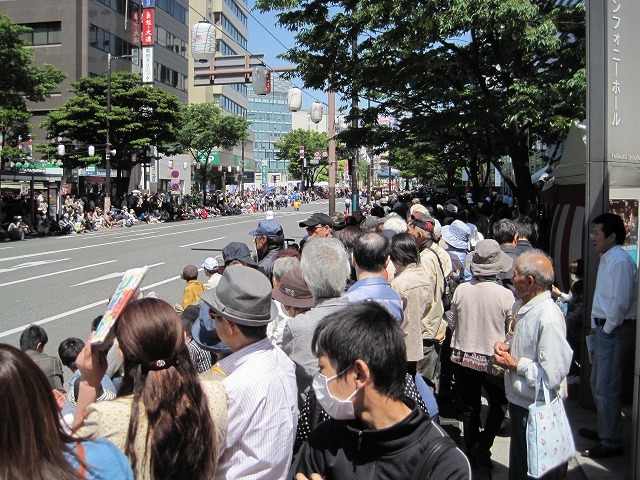 The parade starts from Gofukumachi intersection (呉服町交差点), reach to Fukuoka city hall. 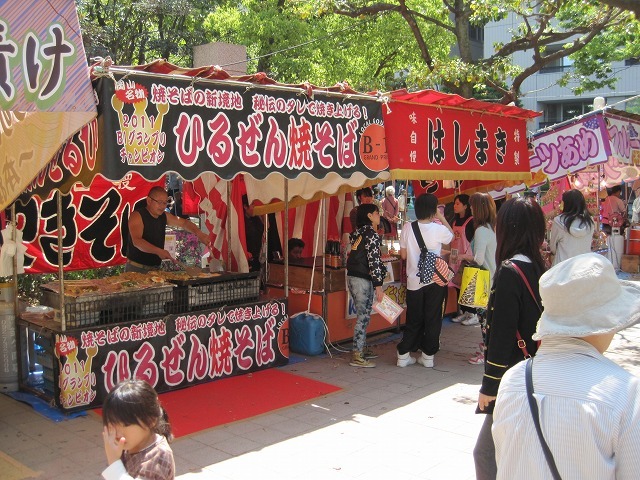 Many stalls were lined up there, selling foods, games and toys at the Tenjin central park (天神中央公園). The parade usually starts around 13 o’clock. 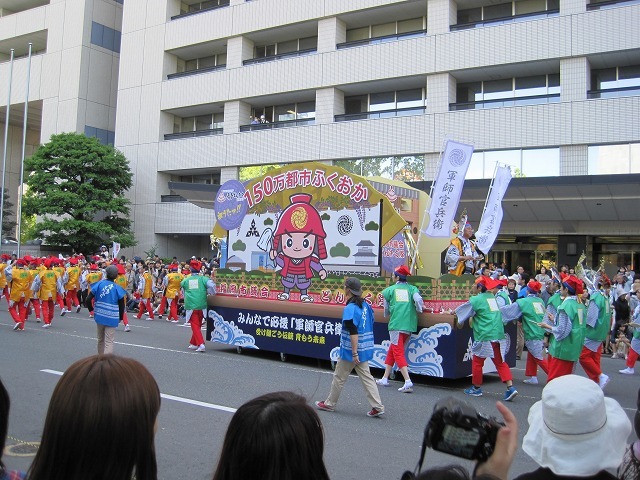 When I arrived the place (in front of Acros Fukuoka bld), the parade had already started. Many types of groups participated in the parade. 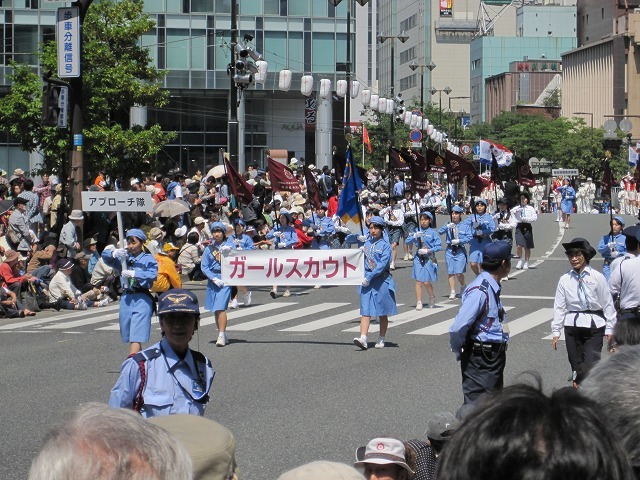 Sponsored companies, Fukuoka police music band, school brass band, and more from local communities were participating in the parade. 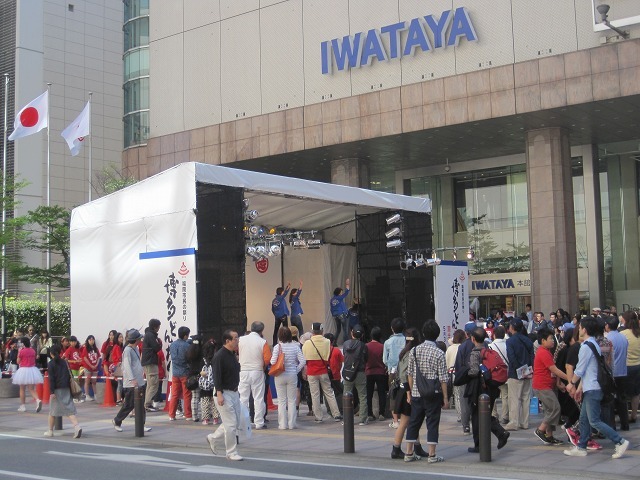 During the festival, we can see many stage shows or street performers in the city like the photo below. Parade address: Meiji street. Start from Gofukumachi intersection (呉服町交差点) through Fukuoka city hall(福岡市役所). From JR Hakata Station: Take a bus number 3,12,13,56,57,100 from Hakata bus terminal and get off at Gofukumachi bus stop. OR walk about 20 min. Parade start time: Around 13:00 to 18:30.